Rotary Club of Shanklin - welcome! Please scroll/swipe down through this page to find out more about us, in addition to the pages linked in the menu, top-left. Thanks to the generosity of all who donated goods and attended the sale, a fantastic £39,000 was collected for all our good causes. Many Thanks to you all! 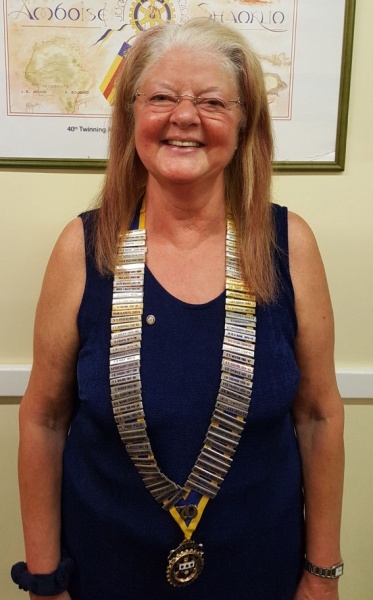 New Shanklin Rotary Club President - Lyn Fleming, has taken office for the next Rotary year. Lyn is the first Lady President of the club and will be presiding over it's 90th year! 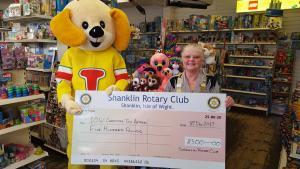 Shanklin Rotary Club was formed on the 1st July 1927. This is our 91st year. There are currently 17 members, 3 of which are ladies. The Club meets every other Wednesday evening at Shanklin Conservative Club for dinner and fellowship. Guest speakers are invited to attend some meetings throughout the year, which prove to be informative and interesting. On the alternate Wednesday evenings we meet informal at the Shanklin & Sandown Rowing Club for Fellowship and Committee business. Every 2 months, the Club has partners' evenings and many social events are organised throughout the year. Such events include' for example, indoor bowling with dinner afterwards, theatre trips, archery, croquet and petanque. Our Club is twinned with Amboise Rotary Club in France and annual exchange visits are great fun! 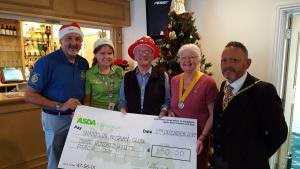 This year, 2018, Shanklin Rotary Club has donated over £37,000 to local charities and International causes. 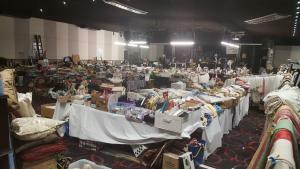 Our main fundraising activity is the Annual Sale of recycled goods kindly donated by the public. This is held each January within the Shanklin area. The proceeds are given to mainly local charities, and to provide assistance with International disasters. The Club has supported the local hospice by providing marshals for Walk The Wight, Barton Manor and the Sweetcorn Fayre. If you are a visiting Rotarian or just a member of the public possibly interested in joining Rotary, you will be made welcome at any of our meetings. Please contact the Club Secretary.